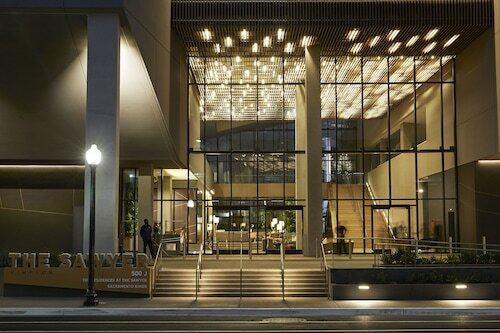 Located in Downtown Sacramento, this eco-friendly hotel is steps from Community Center Theater, K Street Mall, and California State Capitol. Sacramento Convention Center and Golden1Center are also within 15 minutes. Cathedral Square Station is 5 minutes by foot and 12th and I Station is 7 minutes. 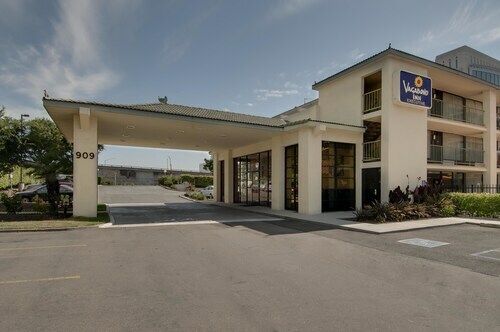 Located in the heart of Sacramento, this hotel is within 1 mi (2 km) of American River Bike Trail and Discovery Park. Sacramento Convention Center and K Street Mall are also within 2 mi (3 km). Township 9 Station is 16 minutes by foot and Sacramento Valley Station is 21 minutes. 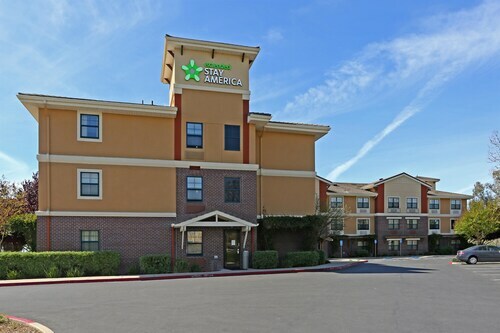 Situated in the suburbs, this hotel is within 3 mi (5 km) of Cal Expo, Sacramento Convention Center, and Arden Fair Mall. California Musical Theatre and Historic Governor's Mansion are also within 3 mi (5 km). Arden-Del Paso Station is 9 minutes by foot and Globe Avenue Station is 13 minutes. 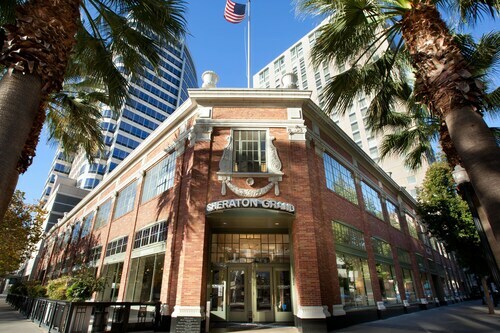 Located in Downtown Sacramento, this hotel is within a 10-minute walk of Golden1Center and Tower Bridge. California State Capitol and Sutter General Hospital are also within 1 mi (2 km). Sacramento Valley Station is only a 4-minute walk and St Rose of Lima Park Station is 8 minutes. 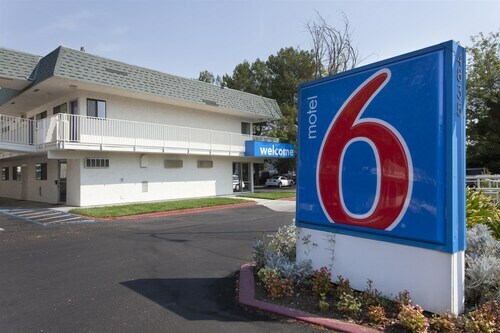 Located 1 mile from Sacramento State University, this motel is 5 miles from Cal Expo Fairgrounds, Water World, and American River. Vagabond Inn Executive Old Town is just off highway I-5 and half a block from the carriage rides of Sacramento’s Old Town. Half a block further, The Golden 1 Center and Downtown Commons lie. The California State Capitol Building and Governor’s Mansion are 1 mile (0.6 km) away, the Crocker Art Museum 2.5 miles (4 km). Guests can drive 7 minutes to the Sacramento Zoo. 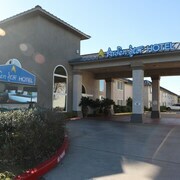 Situated in Davis, this motel is within 3 mi (5 km) of Explorit Science Center, Wildhorse Golf Club, and Rocknasium. John Natsoulas Gallery is 3 mi (4.8 km) away. 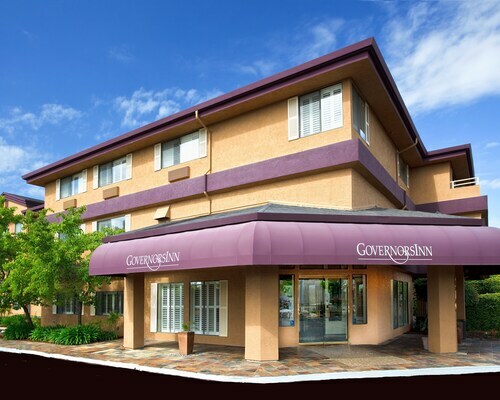 Situated near the airport, this hotel is 2.8 mi (4.5 km) from Discovery Park and within 6 mi (10 km) of Sacramento Convention Center and Golden1Center. K Street Mall and American River Bike Trail are also within 6 mi (10 km). 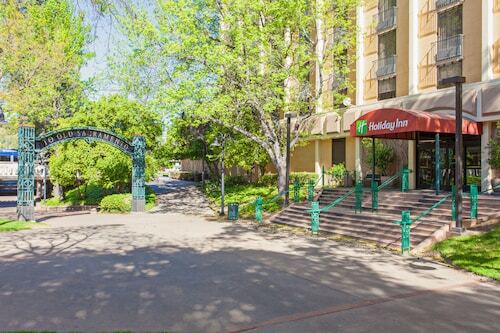 Located in Downtown Sacramento, this hotel is steps from Cesar Chavez Park and K Street Mall. Sacramento Convention Center and California State Capitol are also within 10 minutes. Cathedral Square Station is only a 2-minute walk and 12th and I Station is 6 minutes. 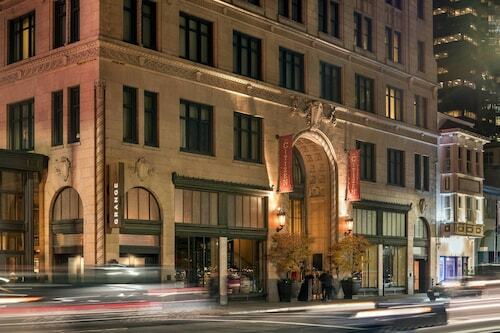 Rising grandly from the historical Public Market Building, this hotel is across the street from the convention center and 2 blocks from the California State Capitol buildings. 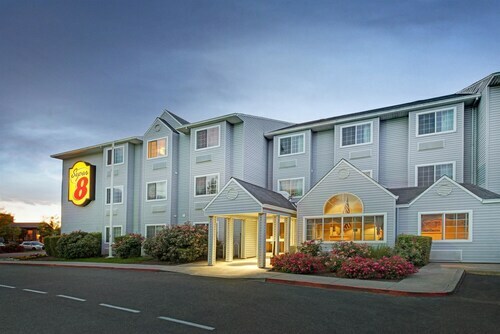 Located in Downtown Sacramento, this hotel is within 1 mi (2 km) of American River Bike Trail and Discovery Park. K Street Mall and Golden1Center are also within 2 mi (3 km). Township 9 Station is 12 minutes by foot and County Center Station is 29 minutes. How Much is a Hotel Room in Sacramento? 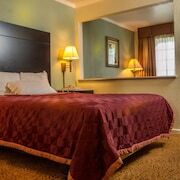 Hotels in Sacramento start at $55 per night. Prices and availability subject to change. Additional terms may apply. The 19th-century philosopher and transcendentalist poet Henry David Thoreau once wrote, “Our truest life is when we are in dreams awake.” As you prepare for your next adventure, wise wanderer, seek to connect with your truest self in the state known for moonshot goals and optimistic idealism—California. Long before the Golden State began to beckon aspiring actors and enterprising entrepreneurs, frontier pioneers and determined panhandlers set their sights on Sacramento to find fortune in the land under their feet. If you long for a relaxed lifestyle that serves as fertile grounds for your greatest ambitions, then it’s high time you took a trip to Sacramento, where you can amble down cobblestone paths, encounter artifacts from long-gone civilizations, and explore a scenic landscape, rich with vineyards. 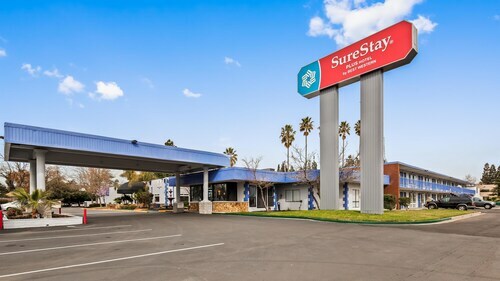 To experience everything this city has to offer, book a stay at any of the hotels in Sacramento, where you’ll wake up feeling more like yourself with each passing day. Where to Stay in Sacramento? 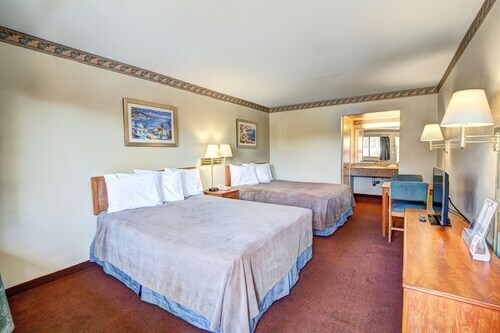 With a wealth of Sacramento hotel rooms to choose from, it’s easy to feel overwhelmed by your options. 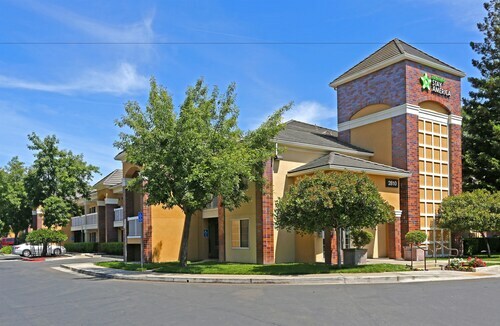 To assist with your decision making, here’s a glimpse of four of the best places to stay in Sacramento. Dawson’s Steakhouse: Among downtown’s most popular dining options, Dawson's serves locally sourced seafood and steaks and has an extensive list of wines, beers, and craft cocktails as well. Vines Cafe: In the mood for farm-to-table cuisine? Vines provides breakfast and lunch buffets designed to help you maintain a healthy diet. Amourath 1819: This high-end lounge in the hotel’s lobby immerses guests in an exquisite atmosphere and invites them to imbibe local brews, handcrafted cocktails, and one-of-a-kind wines while enjoying live entertainment on the outdoor patio. Chef’s Table Experience: Treat your palate to a culinary tour of the hotel’s finest plates with this personalized meal prepared by the hotel’s head chef. Grange Restaurant & Bar: This award-winning restaurant offers a farm-to-fork culinary concept guaranteed to tickle your taste buds. Events for every occasion: With more than 9,000 sq. ft. of banquet rooms and conference rooms, it’s easy to hold events of any size at this unique hotel. Abundant activities: Looking to get some exercise? Take a trip to the hotel’s fitness center. If you’d rather be outside, a handful of golf courses are within a short drive. Decadent dining: Enjoy a complimentary cooked-to-order breakfast in the morning, then unwind over a drink during evening reception. For something more filling, pay a visit to the upscale and outdoor Tower Bridge Bistro, serving locally influenced cuisine paired with picturesque views of the Sacramento River. First-class fitness options: Get toned at the on-site fitness center, walk around the track, or take a dip in the heated indoor pool. Magnificent meetings: With more than 8,000 sq. ft. of event space, the Embassy Suites is the perfect setting for your next meeting. And if you’re in a pinch, the always-open business center can help ensure you’re properly prepped. Epic eats: Cyprus Grille, located on the hotel’s first floor, serves breakfast, lunch, dinner, and dessert, while Q's Pub in the lobby is a great place to grab a quick cocktail. World-class meetings: With 14 meeting rooms and more than 13,000 sq. ft. of event space, the Holiday Inn will help you host your next big corporate event and can accommodate up to 1,000 attendees. Convenient fitness: The hotel’s outdoor pool and complimentary, always-open fitness center ensure that you won’t miss a workout during your stay in the city. Travelocity makes it easy to reserve cheap hotels near Sacramento no matter what time of year you’re traveling. 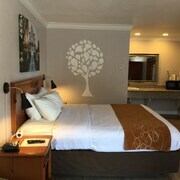 Regardless of what part of town you’d like to stay in or how many people you’re traveling with, you’re sure to find Sacramento hotels that fit perfectly into your budget. Book your room now, and you could be cruising along California’s coast before you know it. For the price it was a place of comfort. Our room wasn't cleaned after we returned from lunch. So we went one night without our room being cleaned. I particularly liked the the friendly helpful service staff. The food wasn't so great. The front desk personal was great, friendly and professional, two very nice experiences. The room was a mess, dirty, and old wash cloth from previous guest I assume left hanging on the shower, old macdonalds wrappers on the floor. No hangers in the closet to hang my clothes up.